When I was a little girl I used to like playing in the back garden making what I called mud pies. I would take soil from a flower bed, dump it into a tin washing-up bowl, tip loads of water on it and then mix it up into a lovely mess. When I finished that I would pour it all over my Dad's crazy paving patio that he had painstakingly created from a job-lot of broken paving stones that had been delivered by the council. To be honest it was more like gravy than pie. My interest in mud survives to this day and this became the focus of this drawing. The mud won out over three other possible contenders which were: the foliage near the middle lock, two narrow boats next to each other and the lock gates of the bottom lock. The day I drew this we had sun all day: it was glorious and so it meant I had to be content to study dry mud as all the puddles had dried up. I chose to sit near to my friend the disembodied head for this drawing. To digress for a moment body parts are not unknown in the canals around London. 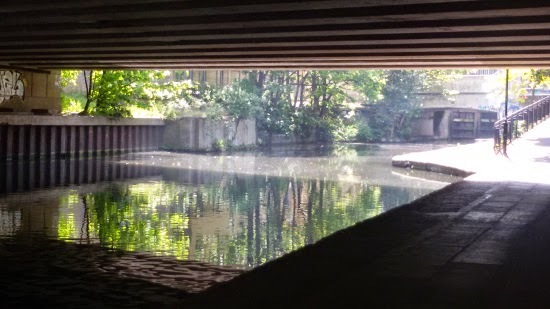 A few years ago a man murdered his sister not far from where we live and distributed parts of her body around the canal system and they were turning up for months and only last week the body of a woman was found in the Grand Union canal in a suitcase. I can't imagine why murderers think that disposing of their handiwork in a canal is a good idea. From where I was sitting I could see this interesting structure. 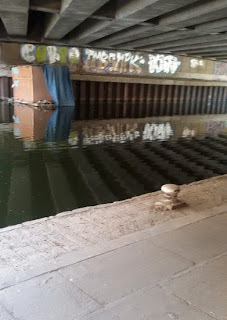 It appears to be a raft with tarpaulins stretched over it. I was sitting there long enough to notice that there was smoke coming out of the little chimney on the top and it made me wonder who was in there and what they were doing there – maybe it is someone's home? When I finally settled down to observing the mud and paving stones I realised I enjoyed looking at the contrast between the lines on the paving stones and the random arrangement of the twigs, dried leaves, stones and the lumps and bumps of the mud so this drawing is a response to that. 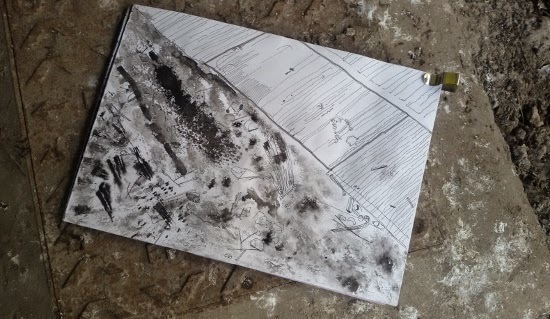 I tried to describe some of the patterns in the mud by applying Indian ink through the sort of mesh bag that you get vegetables in from the supermarket. It worked well when I tried it out at home on paper with a different surface to this one. It worked less well on this occasion 'out in the field'. Love it. You are doing so much work at the moment! Glad you are enjoying this series of drawings. There's more to come.